Syria, Palestine and Roman Mesopotamia were not the only regions in which the Muslims were steamrollering an increasingly desperate defence. Much like their victory at Yarmuk, their victory at Qadisiyyah and Sa’d’s ruthless pursuit of Jalinus had exposed the entirety of Persian Mesopotamia and left the road to Ctesiphon open. With its potential as a focal point and possible springboard for a counter-attack whilst still in Persian hands, Umar and Sa’d quickly decided that neutralising or capturing the Sassanid capital should be their next objective. Less than a fortnight after the victory at Qadisiyyah, Sa’d’s army, now reorganised into five separate corps under Zuhra, Abdullah, Shurahbeel, Hashim and Khalid b. Arfatah, set out across the alluvial plains of Mesopotamia towards Ctesiphon. Seemingly aware of the garrison forces along the route to Ctesiphon, Sa’d sent Zuhra on ahead with a strong advanced guard of cavalry, with orders to subdue the garrisons if he could but, should he come up against a sizeable imperial army, he was to await the main column that was proceeding at a more restrained pace. However, despite the mixture of caution and alacrity, the Muslim advance met with only limited resistance. Zuhra was able to occupy Najaf without any opposition and, while the garrison at Burs resisted, Zuhra defeated its commander, Busbuhra, in single combat and the garrison was quickly overwhelmed. A battle near the ancient site of Babylon is recorded in December 636 against a large concentration of Persian forces, which given that its commanders were Hormuzan, Mihran, Nakheerzan and Beerzan suggests that it was the remnant of the force that Jalinus had extricated from Qadisiyyah. However, given the presence of Beerzan, supposedly killed by Qaqa, and the lack of clear information regarding any battle at Babylon, aside from there being dissension in the Persian ranks and the information that Hormuzan retreated to his homelands in Khuzestan the whole event should probably be downplayed as a major engagement. Zuhra then continued his pursuit of congregating Persian forces. He is thought to have defeated a Sassanid force at Sura before catching up to Nakheerzan’s force at Deir Kab. Despite the killing of the Sassanid commander in a duel by one of Zuhra’s subordinates, the Persian force seems to have offered stiff resistance. It was only a successful flanking manoeuvre by Jarir that captured a bridge to the rear of the Persian lines that seems to have finally encouraged the Persians to retreat. The last Persian attempt to stall the Muslim advance to the gates of Ctesiphon came in early-January 637 at Kusa, a mere ten miles short of the capital. However, this time all it took was the defeat of the Persian commander, Shahryar, in a duel by one of the mubarizun to force the Persians to retreat. With the capture of Kusa, nothing now lay between Sa’d’s forces and the walls of the Persian capital. However, despite the rapidity of Zuhra’s advance, properly defended, Ctesiphon would not be easily captured or even surrounded. This was because it was not a single city but a metropolis that incorporated several settlements including Seleucia, Veh-Ardashir, Vologaesocerta and others on the banks of the Tigris, as well as Ctesiphon itself. Indeed, in Arabic, Ctesiphon was and is known as al-Mada’in, meaning `The Cities’. With the direction they were approaching from – the west bank of the Tigris – the Muslims were to come to the sub-cities of Vologaesocerta, Seleucia and Veh-Ardashir first. Of these three, it appears that Yazdgerd and his generals focused their defensive efforts on Veh-Ardashir, probably due to it being the closest to Ctesiphon itself, digging ditches and placing ballistas and catapults. The presence of such siege engines forced the Muslims back from the walls but they quickly evened the odds by employing Persians to build siege engines for them. By March 637, after almost two months of blockade, the Persian garrison was becoming desperate and sallied forth in an attempt to break the siege. In the subsequent fighting, Zuhra is said to have killed the Persian commander in a duel before being killed himself by an arrow. But one peculiar story stands out most from the siege of Veh-Ardashir: the Persians are said to have used a specially trained lion to disrupt the Muslim cavalry and infantry, with its rampage only being stopped by Hashim, who killed the beast with a single blow with his sword. One cannot help but suggest that this is a prime example of the corruption of the record of a Persian commander either called `lion,’ such as the Greek name Leo, or being described as fighting as fiercely as a lion. As their sally proved ineffective, the Persians offered to recognise the Muslim conquest of all territory up to the banks of the Tigris in return for an end to the fighting. Sa’d replied by saying that peace would only come when Yazdgerd accepted Islam and paid the jizya. The next morning, the Muslims found Veh-Ardashir abandoned as the garrison had somehow managed to slip across the Tigris to Ctesiphon, destroying many of the bridges and taking any available boats with them. Despite these measures and the fact that the river seems to have been in flood, the Persians failed to prevent the Muslims from crossing the Tigris. Taking advantage of local knowledge, Sa’d found a location where the river was fordable and sent a contingent of around 600 volunteers under Asim to force a crossing. 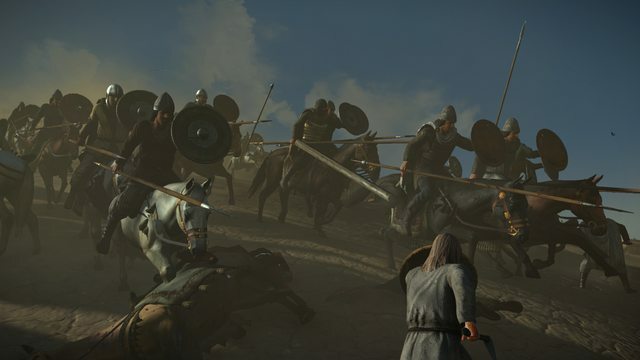 These were intercepted by Persian cavalry, but Asim’s men were able to fight off this attack, establish themselves on the eastern shore and hold their position long enough for Sa’d to get reinforcements to them. With the Muslim army safely across the Tigris, the Sassanid force in Ctesiphon under Mihran and Rustam’s brother, Khurrazad, decided that any attempt to defend Ctesiphon itself was futile and prompted Yazdgerd to abandon the city with his army and treasury. With that, aside from small pockets of resistance, Sa’d and his Muslim Arab force took one of the ancient world’s greatest cities, along with the large amounts of booty it possessed, without a fight. This lack of an organised defence of their capital not only demonstrates the poor state to which the Persian military had fallen through its defeats by Romans, Turks, civil war and now Muslim Arabs, but also how unprepared the Persian defences of Ctesiphon were for an attack from the south. 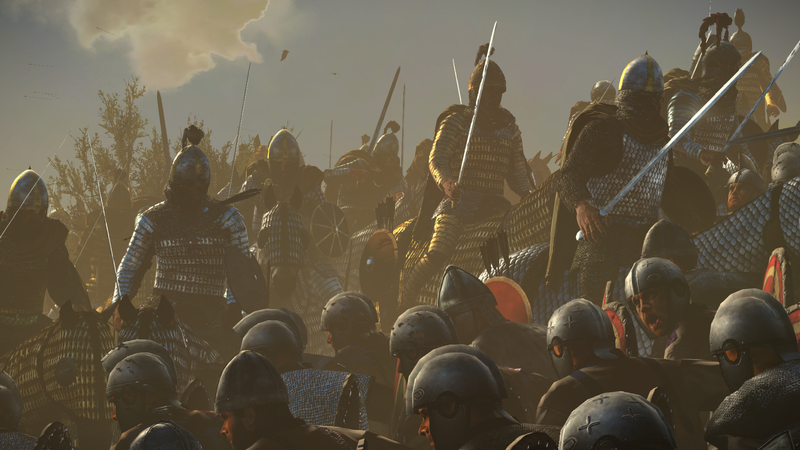 Centuries of warfare against the Romans and the nomadic tribes of the Eurasian steppe had concentrated Persian defensive efforts to the north of Ctesiphon. 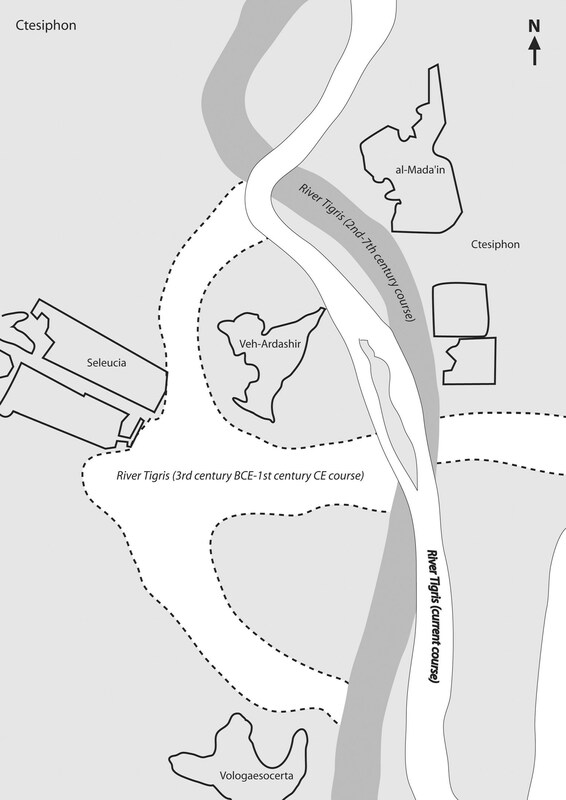 The contrast between the destruction of the bridges over the Nahrawan canal to block Heraclius’ approach in 627 and the ease with which Sa’d approached VehArdashir and then took Ctesiphon in 637 demonstrates the direction in which Persian defences were facing. It could be argued that, by leaving troops in Mesopotamia to slow the advance of the Muslims on Ctesiphon, Yazdgerd assured the capture of his capital by depriving its defence of much needed manpower. However, without garrisons at the likes of Burs, Babylon and Kusa, Zuhra’s advanced guard would have arrived at Ctesiphon before any defensive measures were implemented. Therefore, after the defeat at Qadisiyyah, the Sassanid king and his generals were left with what was a no-win situation with regard to defending Ctesiphon. However, this Persian evacuation of their capital without a fight meant that there were still sizeable Sassanid armies in the field that needed to be defeated before Muslim control of Mesopotamia could be consolidated. The main Persian force under Mihran and Khurrazad retreated north to Jalula, which, as well as being near the modern site of Baghdad, lay on a strategically important route between the Persian provinces of Mesopotamia, Khurasan and Atropatene. There were also forces congregating to the north at Birtha, usually identified with modern-day Tikrit, as well as the significant garrison of the fortress further up the Tigris recognised as modern Mosul. Its governor, Intaq, appears to have moved south to Birtha with his garrison and along with some survivors from Ctesiphon and new recruits from the local Arab tribes formed a sizeable force. The relative proximity of Birtha to the main Sassanid force at Jalula meant that Intaq could move to join his forces to those of Mihran and Khurrazad as well as providing a potential route of retreat for the Persian force should it be defeated at Jalula. Therefore, whilst Sa’d sent the majority of his force against Jalula under Hashim in April, he also sent about 5,000 men under Abdullah to preoccupy if not neutralise Intaq. Upon arriving, Abdullah attempted to storm the walls with a lightning attack. However, Intaq’s men held firm and it appears as though Abdullah became concerned about the size of the garrison. To deal with this perceived strength, the Muslim commander attempted to drive a wedge between the elements of Intaq’s force. Muslim spies made contact with the Christian Arab contingent and persuaded them to side with Abdullah rather than Intaq. The Persians seem to have gotten wind of this betrayal or at least suspected it, as they attempted to abandon Birtha along the river. However, they found themselves trapped between the attacking Muslims and their former Arab allies and the Persian garrison was quickly overrun. A few days later, a small Muslim force received the surrender of Mosul without much of a fight. While Abdullah was cutting off a potential route of retreat and reinforcement for the Sassanids, Hashim had squared up to the Persian forces at Jalula. While the strategic position of Jalula as a crossroads for the Sassanid state meant that it was vital for Mihran and Khurrazad to try to defend it, the position of the town with the Diyala River to the west and foothills of the Zagros Mountains to the east also offered an excellent defensive position. Knowing that the naturally narrow plain in front of Jalula would funnel the Muslim army towards the town and protect their flanks, Mihran prepared diligently for the Muslim attack he knew would come. Jalula itself was turned into a fort, protected by a line of trenches stretching from the broken ground of the Zagros foothills to the Diyala and caltrops to further hinder the Muslim infantry and cavalry. Archers and artillery were also positioned on the fortifications to bleed the Muslims as they approached the walls. Only after inflicting crippling damage on the Muslim ranks would Mihran then leave this defensive position in order to win a decisive victory. Battle of Jalula, 637: Deployments. Upon surveying the disposition and defences of the Persian force, Hashim recognised Mihran’s ploy in presenting the Muslims with only one offensive option – a costly frontal assault. This was something that he could ill afford given that the size of the forces arrayed at Jalula were likely very similar, around 12,000 each. 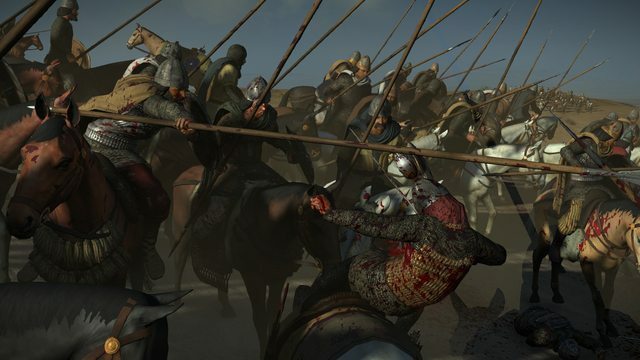 Therefore, Hashim decided to draw the Persians away from their defences by employing one of the riskiest manoeuvres in battlefield tactics – the feigned retreat. The danger of this tactic is that a feigned retreat can quickly become an actual one if the morale and discipline of those attempting it is not strong enough and a counter-attack from the opponent is so well pressed and coordinated as to be impossible to resist. Clearly, after the numerous victories they had won up to the battlefield of Jalula, Hashim had every reason to believe in the discipline and prowess of his men to even attempt such a tactic. 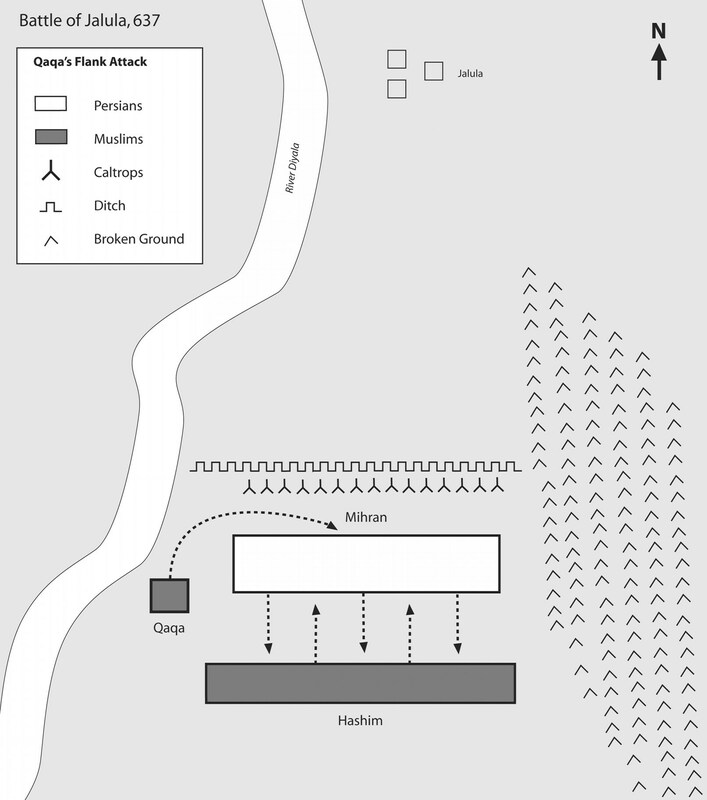 While there is no evidence to suggest that Mihran’s counter-attack was not well pressed, it could be argued that the presence of their own trenches and caltrops could have prevented the Persians from launching a fully coordinated assault on the `retreating’ Muslims as they had to waste time in placing a bridge over the defences. The battle therefore began with a Muslim attack on the defences of Jalula, only for them to retreat under the hail of Persian archers and artillery. Mihran took this as a sign that his plan was working and that the Muslim forces were on the verge of breaking and quickly launched his planned counter-attack. Unbeknownst to the Persian commander, his opposite number will have also been pleased that his own plan was going well. His men had fooled the Persians into thinking they were retreating whilst still retaining their own discipline and order. 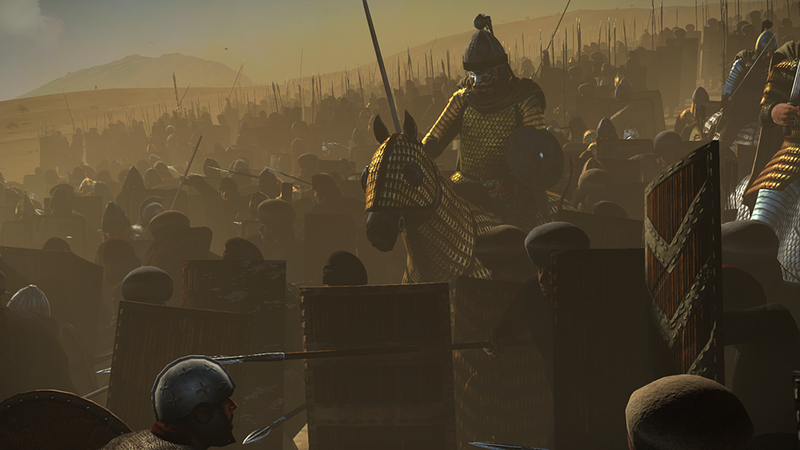 With the Persians now drawn away from their defences, an infantry confrontation took place on the plain before Jalula. Further staged withdrawals by Hashim’s men then opened up a gap between the Persian lines and the bridge route back into the fort and it was then that Hashim launched his counterstroke. Having gathered together a strong cavalry contingent in his rear under Qaqa, Hashim now sent them in an attack around the Persian right flank against the lightly defended bridge. Once word filtered through the battlefront that the Muslims had cut off the only escape route, Hashim ordered his men in a full-scale attack on the Persian lines while Qaqa attacked their rear. Trapped by geography, their own defences and the Muslim forces, the Persian army broke. Despite many men making it back to the fort of Jalula, the defeat of Mihran and the death of Khurrazad had neutralised it as a threat. The exact date for the Battle of Jalula is difficult to pin down from the sources, some of which place the battle at the end of a seven-month siege while others say that the seven-month siege succeeded a battle in April 637. Whatever the order of events, Jalula had fallen to Hashim by the end of 637. The Muslim general then sent Qaqa after those Persian forces under Mihran who had managed to escape. The cavalry commander caught up to them at the city of Khanaqin, some fifteen miles to the east. Some reinforcements from Hulwan may have reached Mihran but they were not enough to prevent a further defeat and the capture of Khanaqin. It is recorded that Qaqa defeated Mihran in a personal duel, removing one of the more capable Persian commanders as an obstacle. Qaqa was now within 100 miles of Yazdgerd III’s base at Hulwan and was to appear before its walls before the end of January 638. However, upon hearing of the defeat of Mihran at Khanaqin, Yazdgerd had retreated further east into the Iranian heartland of his empire, reaching Qom, around 100 miles south of modern Tehran. This hopping from Ctesiphon to Hulwan to Qom was to become a repeating pattern for the rest of Yazdgerd’s life as he attempted to outrun the Muslim advance whilst at the same time trying to bring together an army strong enough to retake his lost lands. 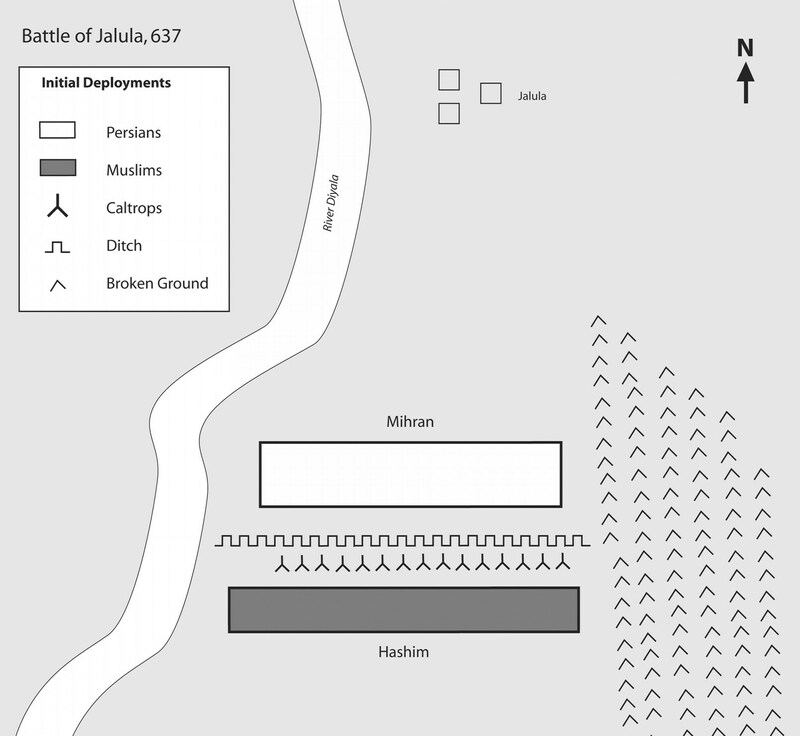 Battle of Jalula, 637: Qaqa’s Flank Attack. With the emperor gone and only a modest garrison left to defend it, Hulwan also swiftly fell. Having settled affairs with the citizenry, the ever ambitious Qaqa then sent to his commander, Sa’d, asking if he could drive further into Iran in pursuit of the fleeing Yazdgerd. Sa’d himself appears to have been in favour of such an advance, perhaps thinking that the Persians were sure to return once they had reorganised their forces. However, Umar was unwilling to further stretch his forces given the effects of the `Year of Ashes’ and the Plague of Amwas throughout 638 and 639 and, as he had done in ordering his men to pull back from a potentially decisive confrontation in Roman Anatolia, he denied Qaqa and Sa’d permission to continue east. What is now the border between Iran and Iraq was to be the effective frontier between the lands of the caliph and those of the Persian emperor, albeit temporarily. The loss of Mesopotamia, let alone their capital at Ctesiphon, was a huge blow, not just to the prestige of the Sassanids but perhaps more importantly to their continued ability to wage war, as those provinces contained a vast proportion of their population and tax revenue. The Persians still held significant territories all the way east to the Oxus and Indus rivers and their Roman neighbours had demonstrated that by identifying the strategic necessity of regrouping such losses were survivable. However, as will be seen, Yazdgerd and his advisers would not exhibit the same restraint and strategic good sense of Heraclius, allowing their loss of dignity to force them into challenging this `Iran-Iraq’ frontier before they had laid any defensive or infrastructural groundwork. This entry was posted in Ancient Warfare, Battle by MSW. Bookmark the permalink.